These are a few gems we have found, it is amazing what some people will do to their homes. Let the buyer beware! In these first two examples, beams were severally overloaded causing significant bowing of the structure. To the left, a roof over a deck had a 4x4 as a beam with to few posts to properly carry the load. This will pose a considerable hazard with wind and snow loads. 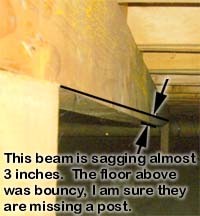 In the right example, a beam in the crawlspace was missing a post. There was another beam parallel to this that had its post in the middle and was fine, this one was skipped. When you walked the bedroom floor over this beam, it was noticeably sagging and very bouncy. We don't recommend waterbeds in this room! In the left example, we are looking under a deck at a built up beam. Notice that there are 2 joists that are doubled up but they do not break over the post. 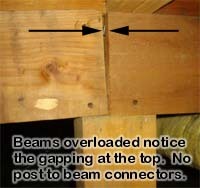 This means the load on this beam is really supported by nails, not be the post. The picture to the right, the post was short, so wedges were put in to tighten this joint up. If it were properly nailed together with post to beam connectors there would be no problem with this support. The boulder next to the beam is not a standard support structure! 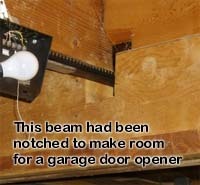 This beam was cut for a garage door opener. 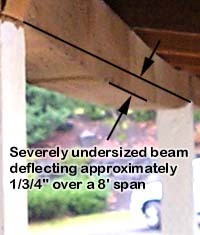 It is never a good idea to cut a beam, but we see this all the time. Any notching of a structural member weakens it, and this is a big notch. There was a 2nd floor above this and all the floor joists rested on it. Not a good idea! You find the most interesting framing in the unseen areas of homes. 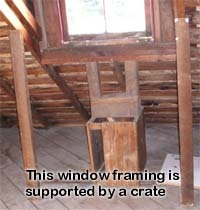 I am sure this window was not designed to be held up by a vegetable crate! The seller was no framer, and should have left this install to the pros. 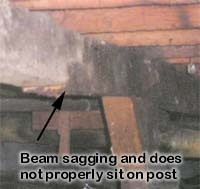 In the picture to the left, the beam is overloaded, you can clearly see this by looking at how this joint is open at the top and tight at the bottom. What you can see in this picture was a slopping floor above. This beam needed another post and positive connectors to tie the post to the beam. This will make this joint much stronger and resistant to earthquakes. To the right is a beam that breaks in mid run, not over a post. again this floor was sloping and we recommend an additional post to pick up the load under the joint. Audible Alarm GFCI's - They can save your bacon! My sink drips and I want to fix it, where do I shut off the water? Honey I fixed the roof..